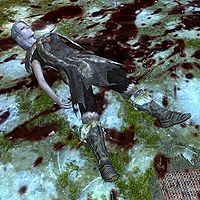 Agna is a dead Nord bandit and Golldir's aunt, who you help look for if you accept the side quest he offers, Ancestral Worship, outside Hillgrund's Tomb. She went into the tomb in attempt to stop the necromancer Vals Veran from defiling her ancestors, but met her untimely end before reaching him. She wears a leveled light cuirass with light boots, and may also wear light gauntlets and/or a light shield. She would have wielded a leveled one-handed weapon and carries a random selection of beverages, food, lockpicks, jewelry, gems, ingots, tools, and gold. This page was last modified on 3 September 2018, at 23:23.